great place to stay! the staff is very helpful and so kind . they have alot of knowledge about the area so the helped me plan my trip in the Japanese Alps . This hostel is in an amazing location right between the train station and old town. The staff were really friendly and the hostel had a really nice homie vibe. It’s also the first hostel we stayed in that had natural light in the bedrooms and a view! The beds were spacious and comfortable. The only drawback was the shower was on first floor and we were on the fourth but we didn’t mind because we loved the atmosphere of the hostel so much. Thanks for having us!! Perfect location (5 mins to Takayama station). It was very convenient as it was walking distance to most of the places and convenient stores location abt 2 mins away. Staff were very friendly and helpful too. I enjoyed my stay here very much. Totally recommended. I also took their shiragawa-go village tour which is worth the money . Also recommended. Staff are great. They were very helpful. They speak English well and Nana speaks different languages like French. We were greeted with a warm welcome and a tea. They have washer and dryer, the room is great and the bedbis so spacious. It's not like other hostels that you have your small cubicle/ capsule. 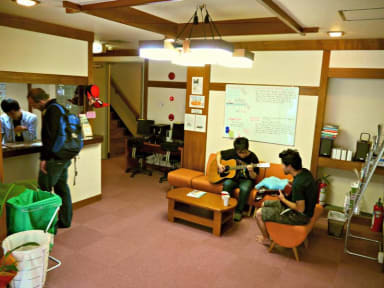 This is my number 1 hostel I've had here in mainland Japan. If you are going to visit Takayama I definitely recommend Jhoppers. Nice hostel, cozy rooms, facilities are Alright. Staff is amazing and helpful. Cool common area as well. Definitely recommend it to anyone, walking distance to pretty much anything in Takayama! Great traditional style hostel. Many thanks to the open, interested and helpful staff for all their advice and tips. Would confidently and wholeheartedly recommend. The staff were super friendly and knowledgeable. There is a lift which is a real bonus. The tatami room was big enough for 3 with luggage. But the place is let down by a cluttered foyer, signs and paper everywhere. Loungeroom uninviting. With increased interest in Takayama from travellers there will be more competition. Good design does not need to cost a fortune -just needs a good eye. Others may not find this an issue. And it is a great location close to train station and eating options. My stay here was fine but nothing too special. Staff didn't really have any suggestions of things to do around the area which i thought was weird!